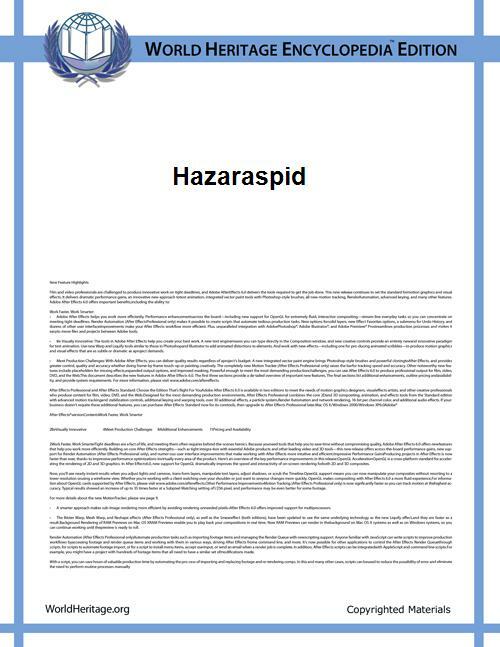 The Hazaraspids (1148–1424), was a Kurdish dynasty that ruled the Zagros Mountains region of southwestern Persia, essentially in Lorestān and the adjacent parts of Fārs which flourished in the later Saljuq, Ilkhanid, Muzaffarid, and Timurid periods. The founder of dynasty Abu Tahir bin Muhammad was initially a commander of the Salghurid Atabaks of Fars and was appointed as the governor of Kuhgiluya, but eventually gained independence in Luristan and extended his realm as far as Isfahan and assumed the prestigious title of Atabak. His son, Malek Hazarasp fought a successful campaign against Salghurids and assisted Jalal-al-din Khwarezmshah in his struggle against the Mongols. Another Hazaraspid ruler Takla, accompanied Hulagu on his march to Baghdad, but deserted because of the murder of the last caliph. He was eventually caught and executed on Hulagu's order. Yusuf Shah I received Ilkhan Abaqa's confirmation of his rule and added Khuzestan, Kuhgiluya, Firuzan (near Isfahan) and Golpayegan to his domain. Afrasiab I attempted to extend his control to the coast of Persian Gulf but faced stiff opposition from the Mongols who defeated his army at Kuhrud near Kashan. He was reinstated by Ilkhan Gaykhatu but was executed by Gazan in October 1296. The capital of Hazaraspids was located at Idaj located in present-day northern Khuzestan. Yusuf Shah II annexed the cities of Shushtar, Hoveizeh and Basra in the first half of fourteenth century. During the reign of Shams-al-din Pashang, the dynasty faced attacks from the Muzaffarids and the capital Idaj temporarily fell into their hands, until the occupiers had to retreat due to their own internecine fighting. In 1424, the Timurid ruler Shahrukh Mirza overthrew the last Hazaraspid ruler Ghias-al-din thereby ended the dynasty.